The 2017 NSW State Doubles were again held at Club Marconi. 14 teams turned up for a great day of snooker, and a state title on offer. 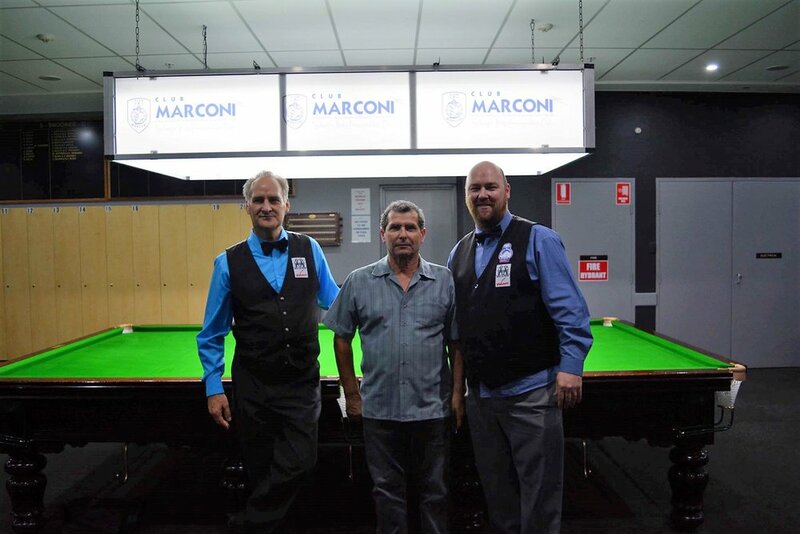 Club Marconi is one of our major venues for billiards & snooker and the snooker club contribute more than a lot to our sport, particularly Jim Ruisi and Vic Sacco, their ongoing support is extremely valuable. If you like a game of snooker, good food and great company. Club Marconi is the place. Congratulations to Alan McCarthy & Steve Jay defeating Hassan Kerde & Zaq Questri 3-1, to win their first state doubles title. Huss & Zaq won a close first frame but lost the next 3 with Alan & Steve proving too strong. Huss & Zaq had scraped through 2 final frames en route to the final, defeating last year’s winners Tyson Crinis & Rod Hart in a extremely close battle. Al & Steve didn’t have it all their own way, having a 5 frame battle with local team Roger Farebrother and Vic Sacco. Roger Farebrother had the highest break of 110. All games were played in a great spirit, and thank you to all teams that entered. The players refereed some of their own games. Many thanks to Neville Moore and Stuart Tait to referee the Finals. And of course again to Stuart Tait assistant Tournament D who is an invaluable Asset to our Game and I couldn’t have the luxury of playing without his help. Thank you Stuart and behalf of the Association Happy New Year.